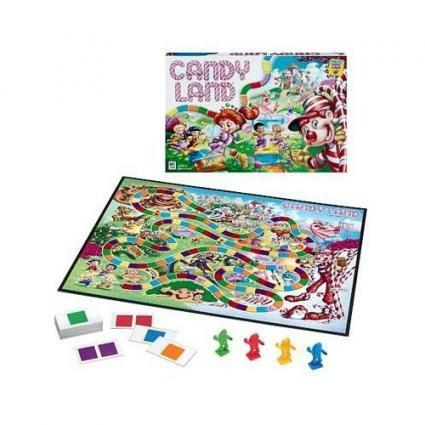 The Candyland board game is probably the starting point for most game players. Its bright colors, references to yummy, sugary treats and the chance to be the first at the candy castle can enthrall children as young as 36 months. It's pure fun for the little game players in everyone's lives. The game was designed in the 1940s by Eleanor Abbott, while she was in a San Diego hospital recovering from polio. She designed the game to capture the attention of little girls in the hospital who were also polio victims. The game was so well-received by the children that she decided to contact the Milton Bradley Company. They bought the rights to the game and first published it in 1949. The first version did not have any characters, only locations (Molasses Swamp, Gumdrop Mountains, etc.). The 1962 version had a revised track layout. The 1980s and 1990s versions included the Mr. Mint and Gramma Nutt characters and the end of the game was a purple square. The current version includes a rainbow-striped square and the Molasses Swamp has been renamed the Chocolate Swamp. In 2005, Forbes and the Toy Industry Association named Candyland as the lead game for the 1940 to 1949 decade. This was also the year that the animated movie Candy Land: The Great Lollipop Adventure was produced, resulting in a DVD game version. Candylane is usually a child's first game because it requires no reading ability and only minimal counting skills. It is recommended for two to four players, ages three to six, but they can start playing as soon as they recognize the basic colors. It does not require any reading skills so it is ideal for non-readers, or children who don't speak English. It teaches the lessons of taking turns, learning rules, counting, color recognition and how to be a good winner or loser. It makes a great gift for the little ones in your life who want something to play while the adults are having fun with Trivial_Pursuit or Pictionary! Shuffle the cards and place them face down in a pile within reach of all players. Each player picks a gingerbread pawn and places it at the beginning of the path. The game is a simple racing board game. The game board is a linear-based track which means that you move your game piece from start to finish in a relatively forward line. The layout of the Candyland game board consists of 140 squares colored after the rainbow. There are other areas on the board besides the colored squares. These other spaces are destinations in the world of Candyland and have cute names like Peppermint Stick Forest (formerly Candy Cane), Gumdrop Mountain and Crooked Old Peanut Brittle House (an original 1940's landmark). A color or a picture - The player moves their gingerbread pawn to a space on the game board which matches the color or picture on the card. If there are two marks of the color on their card, they would move their gingerbread pawn to the second-next space of that color. A picture of a location on the board - The player moves their gingerbread pawn forward (or backward in some versions) to the location on the game board. After they have finished their move, the player places their card in a discard pile. The player to the left has the next turn. Gooey Gumdrops - You have to stay on this space until you draw a card with one or two yellow blocks. Lost in the Lollipop Woods - You have to stay on this space until you draw a card with one or two blue blocks. Stuck in the Molasses (or Chocolate) Swamp - You have to stay on this space until you draw a card with one or two red blocks. There is no optimal strategy or decision making required in Candyland. The moves of each player are determined by the cards. The winner is the first player to reach the candy castle at the end of the path. Playing this game has been a popular family tradition for decades. You and your child are sure to love spending time playing Candyland!